Occasionally a novel comes along that makes me feel inadequate as a reviewer. Kim Scott’s That Deadman Dance did that – a novel I finished weeks ago but needed time to digest before attempting to review. Huge in psychological scope and written in devastatingly beautiful prose, it is about the 19th century colonization of Western Australia. More specifically, it tells the story of those early interactions between the British settlers and the Noongar Aboriginal peoples. The book opens in the early days of the Cygnet River Colony. A time when the colonists, under the guidance of Dr. Cross, coexisted peacefully with the indigenous people. But after Dr. Cross’ death this changes. Not immediately – but as a gradual shift in relations and attitudes. Bobby “Wabalangay” – the book’s Noongar hero – was there when the first “men from over the ocean’s horizon” arrived (or so he claims). He holds a unique position. He spends much of his childhood alongside Dr. Cross. After Cross’ death he is fostered into a white household, and receives lessons alongside the family’s children. At the same time, he retains his connection to his birthright and holds a place of prominence among the Noongar. Scott makes Bobby the character who acts as witness to events. His life is the timeline which encompasses the plot. Yet, while the reader understands what is coming, Bobby remains innocent and is taken completely unawares. He’s grown up between two cultures, feeling equally comfortable (and believing himself equally accepted) in both. The reader observes Bobby as a carefree boy, a confident youth and a lonely old man. The majority of the narrative is told in a linear manner. But Scott makes it more interesting by interspersing the story with flash-forwards of an older, embittered Bobby – long after the Cygnet River Colony has grown into King George Town. It’s a technique that was also used by César Aira in An Episode in the Life of a Landscape Painter, and one I find particularly interesting. By jumping a character forward in time an author instantly creates a new context from which to judge events. He creates perspective, endowing the readers with hindsight even before they reach the end book. That hindsight comes in handy. Kim Scott is telling a complicated and disturbing story. And to ensure he presents all sides, he frequently changes the narrative perspective, moving from one character to another in order to gather multiple impressions of the community: Soldier Killam and Convict Skelly – two of the earliest colonists; Dr. Cross; Kongk Chaine – a man in search of economic opportunities; Jak Tar – a whaler who deserts ship and eventually takes a Noongar wife; and Chaine’s daughter – the object of Bobby’s affections. Kim Scott gives each a chance to speak, and in so doing brings the historical record to life. Not always by presenting the hard, direct facts. Sometimes, the reader is left to infer the mood – or as the old saying goes “test which way the wind is blowing” – by observing. The most moving, and telling, example is the passage that describes what the Noongar call That Deadman Dance. The dance? You paint yourself in red ochre, neck to waist and wrist, and leave your hands all bare. White ochre on your thighs, but keep your calves and feet bare, like boots, see? A big cross of white clay painted on every chest. The dance, which starts out as mimicry, becomes almost sinister when you realize that as the relationships between colonists and Noongar changes, so does the dance. And that Bobby is the first to demonstrate this. While That Deadman Dance doesn’t shy away from the difficult subjects of colonization, its effect on indigenous people and racism – Kim Scott doesn’t stop at describing a time period, historical injustices or community dynamics (all of which he does skillfully). He also recreates a place. He describes the early Australian landscape in vivid – and brilliant – detail. It is as much character as any in That Deadman Dance. A character, I’d argue, who is second only to Bobby in the hierarchy of the story. The passages where Scott describes the wilderness and the coastline are amongst the most breathtaking I’ve read. There were many small, dry and obviously intermittent tributaries and patches of soggy, recently burned land. One creekbed, descending a rocky slope, became a sequence of small deep pools stepping from one level to the next. An eagle in a large tree beside one pool, its nest surprisingly close to the ground, returned their gaze. 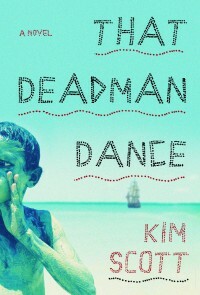 That Deadman Dance is a remarkable novel in many respects, and the prose style of Kim Scott was a wonderful surprise. I’m not entirely sure why it was a surprise, as I first learned about him from an excellent source – Lisa Hill at ANZ LitLovers LitBlog. But, I suppose in a way, that’s what is so perplexing. Why hadn’t I heard of him before? Why isn’t his name topping the lists of international literary awards? How come I know the name Peter Carey (an author I’ve tried to read multiple times, yet never with any sense of enjoyment) but just learned about Kim Scott? It’s a question I can’t answer, but an oversight that I hope I (and this review) can play a small part in rectifying. OH, I’m *so* glad you liked this book, and yes, I agree entirely, why isn’t this book on bestseller charts everywhere?! I didn’t like this book, Lisa – I LOVED it! The scene at the end *spoiler alert* where Bobby dances and Scott tells you what he’s wearing – it so perfectly captures how these two societies don’t see each other. For me, it powerfully demonstrated the disconnect on how Bobby perceives himself and how he is viewed by the colonists. As for the writing: it is so lyrical, and the story so tragic. You know I could go on… After I finished it I peeked at your review of Scott’s other novel and am planning to to get a copy this week. By the way – I don’t know if this happened in Australia, but the blurb on the back of the American edition almost implies it’s a Romeo & Juliet style love story! Which is ultimately such a small element of the plot. I thought it was a shame, because it is misleading (and does a disservice to the novel).